Ties With Syria Warm Under Wary Lebanese Eyes Lebanon and Syria have had tense relations since the 2005 assassination of the Lebanese prime minister. Today, the two countries are experiencing a rapprochement that could yield significant economic benefits. Some Lebanese, however, wonder how long the positive trend will last. 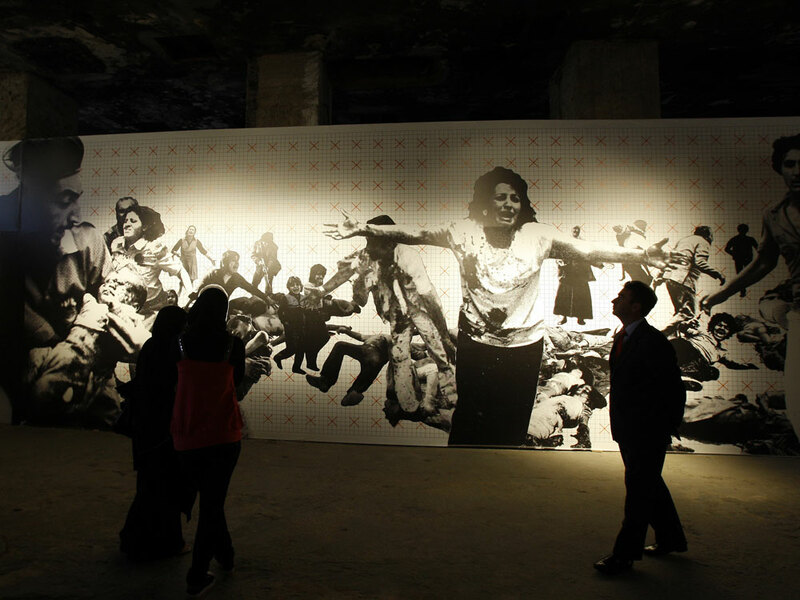 In Beirut on April 13, visitors stroll through a photography exhibition on Lebanon's 1975-1990 civil war. That day, Lebanon marked the 35th anniversary of the outbreak of the war, which saw the beginning of 29 years of Syrian dominance over Lebanon. Now, those old enmities are beginning to dissolve. Lebanon and Syria have had tense relations since 2005, when Syria was forced to withdraw its troops from its smaller neighbor after the assassination of the Lebanese prime minister. But today, the two countries are experiencing a rapprochement that could yield significant economic benefits. Wary Lebanese, however, are wondering how long the positive trend will last. The 35th anniversary of the start of the Lebanese civil war -- one of the defining Middle East conflicts of the late 20th century -- took place last week. 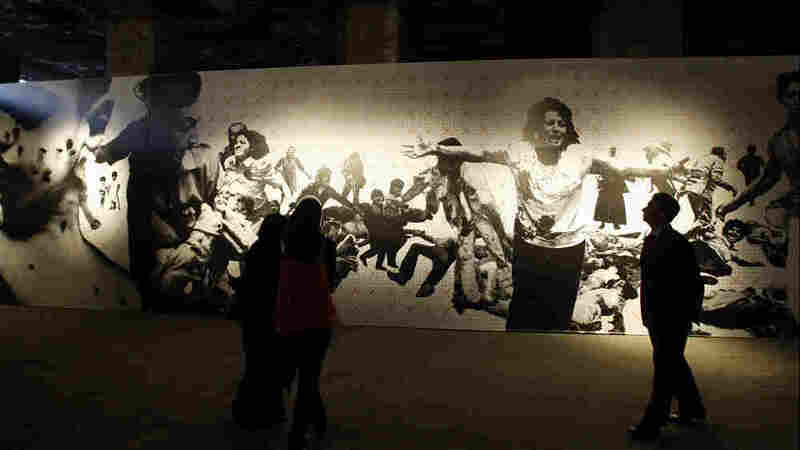 In Beirut's Martyrs' Square, young performers danced and acted out scenes from the 15-year conflict, which left tens of thousands dead and saw the beginning of 29 years of Syrian dominance over Lebanon. 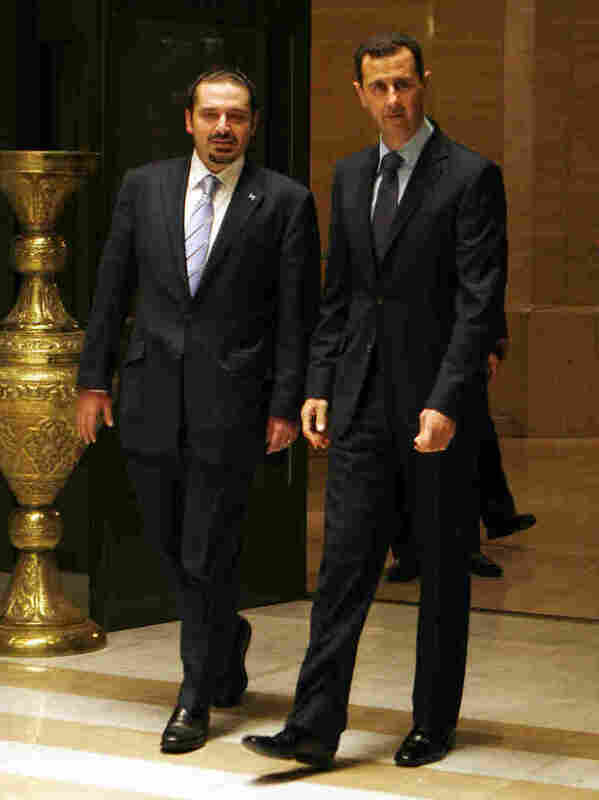 Syrian President Bashar Assad (right) bids farewell to Lebanon's Prime Minister Saad Hariri after three-hour talks at the presidential palace in Damascus late last year. Hariri is planning another visit, despite the widespread belief in Lebanon that Syria ordered his father's assassination in 2005, a charge Syria denies. But these days, some of the old enmities and barriers are beginning to dissolve. 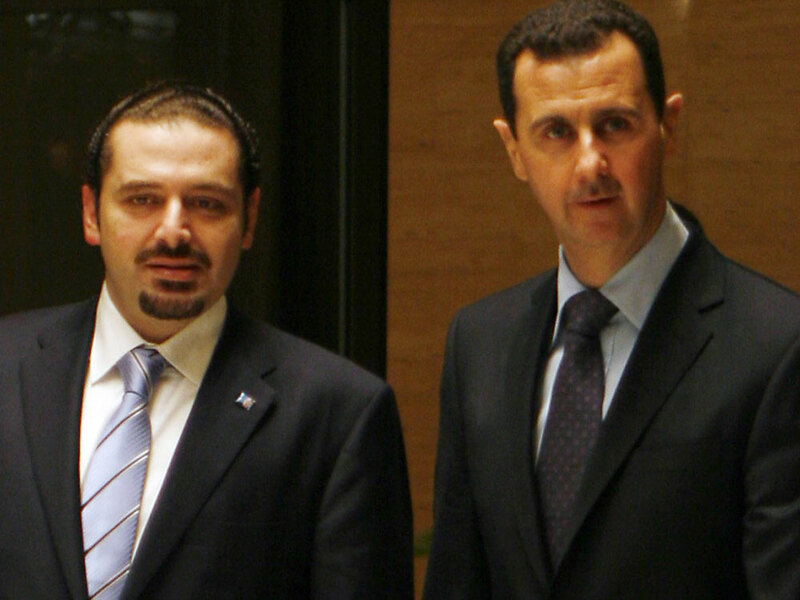 Lebanese Prime Minister Saad Hariri has made one cordial visit to Damascus and is planning another, despite the widespread belief in Lebanon that Syria ordered his father's assassination in 2005 -- a charge Damascus denies. Hariri's political adviser, Mohammed Shatah, says Lebanon has not forgotten the issues that continue to divide the two countries, but that this shouldn't prevent cooperation where it's possible. "Saad Hariri stretched a hand to Syrian leadership, which was a major step after the events of the last five years," says Shatah. "We're not going to stop normal relations or normal contacts because we don't see eye to eye on some issues, important as they may be." For Syria, the warming trend means tapping into economic opportunities in Lebanon. For long-occupied Lebanon, the historic opening of a Syrian Embassy in Beirut is a sign that Lebanon is at last being treated as an independent, sovereign state -- something the Syrian leadership has been loath to do. There are a number of factors behind the rapprochement, notably the ongoing effort by moderate Arab states to pull Syria out of its regional alliance with Iran. Analysts say Damascus has responded positively on issues of common concern, such as the shape of the next government in Iraq. But Beirut analyst Paul Salem, with the Carnegie Endowment for International Peace, says Iran has no reason to be worried by the recent diplomatic moves among Arab states. He says the core Damascus-Tehran strategic relationship hasn't been shaken. "Iran is not terribly concerned that Syria is going to switch sides. Syria has not switched sides; it has remained on the same side, but improved relations with others in the region," Salem says. Analysts say not only has Syria not switched sides, its interests in Lebanon -- and those of Iran -- are in better shape than they have been in years. Their ally, Hezbollah, is not only an important Lebanese political player, it has an effective veto over sensitive policy decisions. The issue of disarming Hezbollah seems dormant in Beirut, despite the best efforts of Christian politician Sami Gemayel. He hopes that the topic will surge to the fore as concern mounts over reports that Syria has smuggled long-range Scud missiles over the border to Hezbollah, despite Syrian denials. "It can't be ignored, and we will call the government to take a very clear statement about what's happening on the borders," Gemayel says. Analyst Karim Makdisi at the American University in Beirut says that all in all, it seems this thaw in relations between the Lebanese and the Syrians could continue for some time, but only if things remain quiet. The one potential stumbling block? The Israelis. "Israel is always going to be the wild card in this region. It's always going to be the one that can launch an attack on any of its neighbors or any of the Arab countries anywhere across the Arab world. Then, of course, all bets are off, and it's impossible to predict what could happen," Makdisi says. And in the complex web that is Middle East geopolitics, analysts say a new round of violence would likely have repercussions far beyond Lebanon.